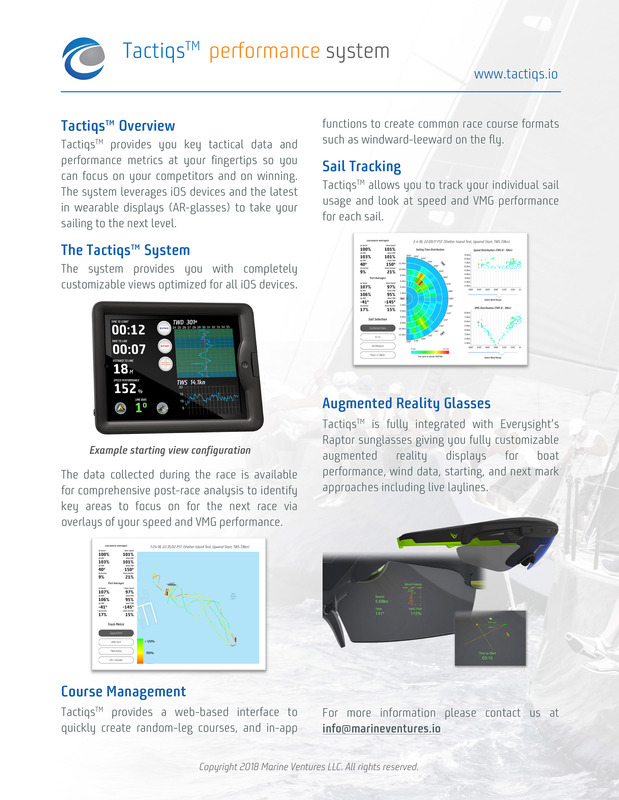 The Tactiqs™ Performance System was designed to help sailors understand the conditions and the race course to make better decisions and win more races. The system is comprised of a data gateway providing the boat's sensor data via a wireless NMEA interface to the Tactiqs™ application, allowing the crew to use any number of iOS devices as customizable displays for 36 different performance metrics. Post-race analysis tools give you the details on your performance and let you review the race in numbers. Addiditonally, the Tactiqs™ system offers custom augmented reality displays in the form-factor of sun-glasses that provide you the key data right within your field of vision. Once you have raced with this level of understanding your boat's performance in realtime you will never want to go back.